The highly stylish, smart, successful, forward-looking breakfast nook Chez Bates had known some happy times. Days when the sound of laughter and dozens of designer shopping bags crinkled as they were brought into the house. Things seemed a bit colder this winter. Recent events were not helping. Princess Bates daintily spread low-calorie margarine on her low-calorie rice cracker. At the other end of the table, Master Bates lazily ate a full Scottish breakfast while reading the lastest Evening Express. But even the exciting story ‘Ghost Found in Photograph Drunks Took in front of Restaurant’ headline wasn’t cheering him up. He thumbed through pages of riveting news stories in the papers he edited – ‘Shopping Trolley Stolen’, ‘Cold Weather Expected in January’ and ‘Pope is Catholic Shock’ and then came to the ‘Beautiful Bride’ competition page. The latest brides smiled up at him. How long ago his own wedding to the most beautiful girl in the world seemed somehow. A long, long time ago. There was their photo, sitting on the mantelpiece. How wonderful their afternoon was on the Northern Belle; and the photo of them sitting together smiling for the P&J cameras was even available for people to buy for their own homes. The recent prang with his Maserati had made him reassess what was important, and perhaps it was time to rein her spending in a bit. There was this Lotus up for sale which would be perfect for driving to work in Maastrick in. The Princess was not smiling. It had been a hard week. Film and news crews crossed Trump International Golf Links Scotland’s parking lot to access the dunes. Phonecalls even came in. Suzanne Kelly had the audacity not only to suggest Donald was somehow a mean guy, but also to ask Trump Golf to restore Michael Forbes’ fishing rights and take down the big pile of earth which was called a bund from in front of the Munro cottage. All the terminology Sarah had needed to learn! A bund was a big pile of earth. A bung was a big envelope of money. It was easy to get confused. She did remember though that Mr T and Georgie Sorial had told her that any compromise was a sign of weakness. It was her duty to be every bit as strong and smart as Donald was always telling the world he was. She had also been asked to be in a live debate with Kelly, but Mrs Bates was not taking the bait. Talking about the wonderful course she knew so much about would have been easy of course. But all this other stuff about the UK’s Public Order act, laws, hate speech and petitions was so confusing. What did it matter anyway? After all, Donald was pumping hundreds of millions of pounds into a grateful Scotland. Why couldn’t they just leave him in peace so he could be president and get rid of all those nasty Muslims, Mexicans, handicapped people, women who weren’t pretty and other awful people? Who cared about Muslims when there was money to be made? She just didn’t understand what was wrong with other people’s values. The rice cracker snapped under the pressure of her knife as she thought of these things. Master Bates peeked from behind his newspaper, hoping it would be a good time to broach a difficult subject. “Well,” said Damian, thinking the allegedly offensive piece of shortbread looked like a blob and nothing more, “Some people might think it was hypocritical – that means unfair” he added hastily, seeing her perplexed face. “Donald didn’t like it, and that wasn’t free speech it was a picture, so that’s different.” Sarah helpfully explained. She’d stopped nibbling her rice cracker now. Really, for a newspaper editor person, Damian didn’t understand some very basic things. She was reading it from the large font printed sheets they’d given her the other day to practice saying. The Princess was not going to have her husband question her about these little details. He thought of where he might be. To change the subject seemed the way forward. The Princess reached for her handbag and got out her magnifying, light-up mirror. “Where? Where?” she asked in blind panic. “Not you, never – let’s avoid any worry. Or too much overthinking. Don’t you worry honey. All’s fine. I’ll run your quote in full.” Master Bates said soothingly, but his brow showed some signs of stress. The Princess pulled out a small rectangular package. Perhaps a Louis Vuitton credit card case? A voucher for the Marcliffe? As he opened the package, for the first time he felt a bit angry. “I’m not wearing a goddamned polyester tie for anyone! Thank F*£$”! no one’s seen me in the golf cap” he thought. Grabbing his last piece of toast he got up. Master Bates’ voice was perhaps a bit terser than usual. He thought about asking here where on earth ‘hundreds of millions of pounds had been pumped into the Scottish economy by her blustering boss. Master Bates looked at the photo of them as newlyweds on the mantle piece, and thought, there’s more than a few wrinkles between then and now. He grabbed the toast, flung her the credit card, and grabbed the Maserati keys. Old Susannah aka Suzanne Kelly casts an eye on the past week’s vibrant and dynamic events. Tally Ho! It’s been bonfire night, which here in Torry means another 7 weeks or so of fireworks at night. The Members (‘Sound of the Suburbs’) played at the Moorings; the Gerry Jablonski Band is touring Poland, the Opera was in town, and the fireworks went well (better than the last time, when everything went off all at once). Giant balls and lights are being hung on Union Street for the holidays. Let’s hope the balls don’t drop, like they did a last year. I bought a wonderful new mattress from Glencraft; the company continues to employ and support people with visual problems and others with special abilities. It’s just as well it’s still here, those nice ConDems have a plan to save money by taking it away from several thousand people who get independent living benefit. At present a court appeal is saving the day. Let’s hope commonsense prevails at least once. If those individuals and corporations which avoid paying tax paid their fair share, we’d possibly not be in such a position. But they know who they are, and they’re holding onto their money. Aberdeen Positive (cleverly branded AB+), had one of their inspiring cultural talks this week. They’re going to give us a cultural identity brand, which is great. BP is of course involved, as are various other businessmen, and RGU admin types (who I’m sure don’t take any direction from web-happy Sir Ian Wood, who is more or less in charge at RGU). Old Susannah tragically couldn’t make their last meeting, but was told a riveting time was had by all. Sadly someone dared to bring up the subject of Union Terrace Gardens; this dismayed the convener. Happily just at the end, our man from RGU (who’s actually lived in 27 different places, so he proudly boasts – wow!) closed by saying we need a public square. Of course we do. I’ve spent a happy few hours this past week at BrewDog, you’ll be surprised to hear. They’ve run out of their new creation ‘Hello my name is Sonja’ – which is a blueberry packed delight. Hope it’s coming back soon. There was some pumpkin brew from the US, which was subtle, and perfect for this time of year. And yes, I’ve even bought a few more shares. Me and a few thousand other people. BrewDog are hiring, reinvigorating the drinks sector in the UK and abroad, and are expanding. If my few quid contribution helps, then I’m glad of it. Cheers all. It’s a good thing people’s noses don’t actually grow when they lie like Pinocchio’s did; or else some of the great and the good would have to either clam up or hire permanent plastic surgeons. Truth, or the lack of it, has featured largely this past week in the news. In mythology, Diogenes searched endlessly for an honest man. It seems like he’d have his work cut out for him today. Here are a few definitions to illustrate. Lying: (English Gerund) To deliberately distort the truth. Times have changed; and I think people are getting much more honest than they used to be. After all, absolutely no one, no matter what kind of situation they might get caught in, admits to lying these days. We’ve seen the ‘Plebgate’ case unfold: first policemen accused senior Tory MP Andrew Mitchell of a foul-mouthed rant over a bicycle, which upset the public. Later, Channel 4 obtained the footage, showing no public within earshot at all. The police logs seem to have been creative writing exercises. What followed, when the police and their superiors were asked to explain further, saw one or two innocent little white lies coming to the fore. Mitchell lost his job, had never used the word ‘pleb’ and it’s proved no such rant actually happened. Mitchell may have lost his job over this, but don’t worry: all the police involved are still in place, ready to continue to fight crime in their usual virtuous fashion. “A police officer has apologised to MPs for an “inadvertent error” in evidence to them about the “plebgate” affair. “Det Sgt Stuart Hinton, of Warwickshire Police, said he had made an “honest” mistake in a previous hearing held by the Home Affairs Committee last month. “He also said he regretted the “distress” felt by Andrew Mitchell and his family during the whole saga. So, no lying there then, just the odd ‘inadvertent error’ and the odd ‘mistake when talking to the Home Affairs Committee. Could happen to anyone. Just because we assume the police can and should have a head for accuracy and details is no reason to think they’re superhuman. In fact Sgt Jones also managed to forget any claims had ever been lodged against him, but this was soon proved to just be another little mistake on his part. He seemed very believable to me in his court appearance; first of all, he’s a policeman, and second of all, he was wearing a nice suit. Did the policeman admit to blatantly lying by making up this little story that cost someone a job? Not a bit of it. He does however regret things. I’m sure he does. So how did the press get all the previous alleged dirt on former MP Mitchell? Er, the police leaked it to them, but I’m sure it was all well intentioned. It’s very bad form for the BBC and Channel 4 to point out these flaws, and to remind us that policemen from the slightly powerful union would wear ‘police pleb’ t-shirts to show solidarity for their ‘inadvertently erring’ colleagues. That’s what friends are for. Perhaps we had expected the politician was lying in the ‘Plebgate’ saga; after all, there have been one or two small instances of politicians lying to us in the past. Even Tony Blair decided to turn an intelligence dossier into a spectacular, sensational, frightening case for attacking Iraq. Weapons of Mass destruction were poised and ready to take the UK out within 45 minutes; of course we had to have a tiny little war, even if a few million UK residents marched to protest against it. After all, we’re better off, the veterans who went there are better off, and of course the Iraqi people are better off. As is Halliburton and as are a few US tycoons. Aside from the dodgy dossier, we had the earlier instance of saintly Alan Clark, purveyor of truth back in the days of Thatcher. The Matrix Churchill trial saw gagging orders handed out like sweeties. It was all going so well against the businessmen involved, who had been granted export licences to Iraq. It might have looked like the Government was caught in a web of blatant lies, but that wasn’t the case. Alan eventually admitted in the face of evidence that he was just being ‘economical with the actualité’. So, once again, no real lying was going on. 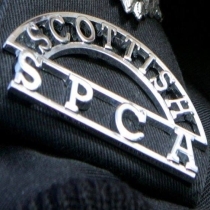 Don’t worry, Aberdeen makes the grade when it comes to having honest police. We now have our own local policewoman who managed to avoid being branded a liar and/or snoop. WPC Amanda Dixon decided that she needed to know a wee bit more about her new Peterhead neighbours; the poor policewoman was in fear they would break the law and rob her. She then merely bent the law a little, and used the police’s STORM database to do a little pre-emptive spying on them. Sure, it might have been illegal, but she is a policewoman after all. While in the old days, if people wanted to snoop on neighbours they would simply hide behind twitching net curtains and peer, it’s nice to know Dixon is willing to go just that little bit better. I can’t think why she got into any trouble for illegally accessing personal data in contravention of the Data Protection Act, but the story has a happy ending: she didn’t have to go to court. Obviously admitting no lawbreaking, Dixon bravely admitted being ‘nosy’. Thankfully her lawyer told the sheriff that Ms Dixon was too mentally fragile to appear in court and such appearance would be detrimental to her mental health. I, for one, am so very grateful to the legal system for sparing her this huge trauma of attending court, which clearly would be something a policewoman would never need to do normally as part of her job. You might think she was just trying to evade justice, but surely it is health after committing a crime that’s more important than the people being spied on or the law being upheld. Now that the police have displayed such compassion to spying Dixon, I await their expedited compassion in offering compensation to George Copland. If you need a reminder, Copland was arrested days after a siege at his empty flat. The flat was meant to have a gunman in it, although it was empty, and whoever said they were looking in the windows at a gunman would have had to go very close to the house, set away from the main road and peer in deliberately. Perhaps it was Dixon? Anyway, that was in June. No doubt a fair, full compensation deal is winging its way to Copland as you’re reading. Police don’t lie, and they don’t break data protection rules, fabricate notes, and leak info to the papers. They might sometimes make mistakes, but don’t we all. And if police like Ms Dixon spy, I’m sure it’s for our own good in the end. No doubt her neighbours think so. Spying: (English Gerund) The act of covertly obtaining information without the person or organisation being scrutinised giving consent or having knowledge. In this Age of Information, the only thing that’s successfully stopping wars, terrorist attacks, organised crime, and Policewoman Dixon’s neighbours from undoubtedly robbing her is spying. I am very glad big brother is watching. I am very glad that the ‘all-seeing eye’ on American dollar bills stands for something less nebulous than some Masonic symbolism. Spying is only done when necessary. Sixty Million Spanish telephone calls were intercepted by the US. Yes, that hardly seems like any, and that’s actually the number of calls for a whole year’s worth of listening in. I’d have thought it would be a higher figure, after all the population of Spain is about 47 million: that’s only about a call and a half per citizen. However, Germany’s Angela Merkel is a bit put out the Yanks have been spying on her personal calls, and there is some evidence to point to the UK helping the US out in these covert activities. As so many right-thinking people claim ‘if you’re not doing anything wrong, then you don’t have anything to hide’. Quite so. Perhaps we should just give up on the idea of individual freedoms, privacy, intimacy and individuality if it means we’ll all be safer. It would be churlish to bring up the fact that back in the day, famous cross-dresser and paranoiac J Edgar Hoover had files on millions of Americans. If he needed one of these people to spy on other people, all he would have to do is threaten to expose the personal info he’d collected on them. If we could only get back to those good old secure, happy days – Communist witch hunts, paranoia, government control. Thankfully, it seems we’re heading there. Sometimes it might seem that the security forces and police get a bit sensitive about sharing the details of their own activities – particularly when these activities fall into grey areas of law. No doubt if they want our lives laid bare for their legal inspection (or for a less than legal whim, Ms Dixon), they’ll become completely honest, transparent, and law-abiding as well. I feel sorry for those who make their living from spying on the innocent, that nasty whistleblower Edward Snowden has made life tricky for them and their crucial work. He’s obviously let the world know the extent of US snooping for his own personal gain. He’s currently living a luxurious life as a fugitive in Moscow somewhere (no – I don’t know where to any government spooks reading this). After all, the people who are willing to look into your and my personal business for reasons ranging from national security to Dixon’s ‘nosiness’ are just trying to make an honest living. Well, have a good week everyone. And mind what you put in that email, or say on your mobile. Big brother is listening, taking notes, and will be in touch. 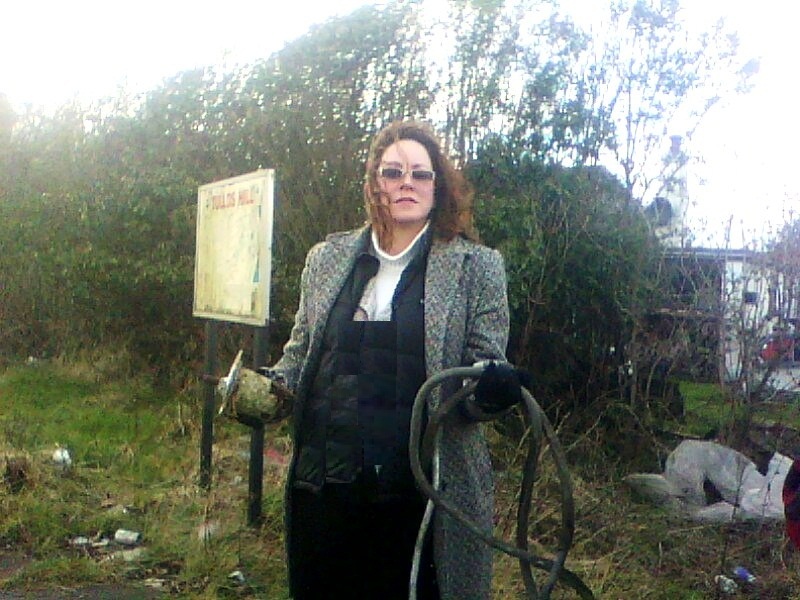 Old Susannah, Suzanne Kelly, gets to grips with Grangemouth, Granite Webs and Gardens. The revolution may or may not be televised, but almost everything else is being privatised. Tally Ho! Well, it’s been a colourful week in the Granite City; plans for the city centre are being drawn up, and that’s something you don’t see every day (unless you get the P&J). Apparently all our problems are solved if we let one Sir Ian Wood give us £50 million, and let him raise (or is that ‘raze’) Union Terrace Gardens. If only we’d have known that before! All we’ll have to do is hand control of Union Terrace Gardens over to a few committees, stocked with powerful people, Wood’s friends, special friends and relatives, and ignore the fact you and I own this land under common law. Oh, and we are thinking about trams. No reason to think trams aren’t a good idea; I’m sure the successful tram programme in Edinburgh can be reproduced in the ‘Deen. I’m sure whatever Ian wants for UTG is just what Robert the Bruce would have wanted when he bequeathed the gardens to you and to me. Bruce famously sat in a cave, feeling defeated when he spied a spider weaving a web. The spider’s perseverance and determination had a profound effect on the heroic Bruce. He watched that spider, and decided that a web – made of granite – was what we would eventually have the ambition to build over the gardens. For some reason architects Halliday Fraser Munro continue to make, free of charge, imaginative Escher-esque drawings of the city centre. These can’t actually be built, but they are pretty. Questions like ‘What will happen to the businesses on Belmont Street, which currently have pleasant vistas overlooking the gardens’?, and ‘How will the centre of town suddenly be pedestrianized’? are just minor details we can iron out once we agree to the plans. Dame Anne Begg opened an exhibition on the history of witchcraft in our city over the centuries at the Tollbooth Museum. I could have nominated some better candidates for the witchcraft lecture. 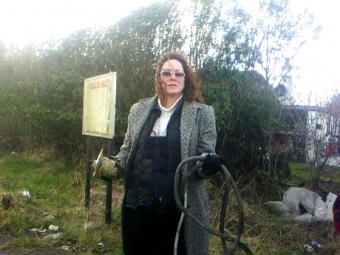 Aileen Malone (known for sacrificing animals i.e. deer, in the hope of getting £££) and Kate Dean (famous for making vital support services vanish) each seem to have a fair amount of free time on their hands these days, and their undoubted personal knowledge of the dark arts and witchcraft would have been illuminating. Speaking of witches, I saw some graffiti recently which I can’t quite understand. I was in London this past weekend. As my train made its way into the city, very large graffiti on a building caught my eye: “The Witch is Dead, but the Spell Remains”. I wonder who this referred to? No doubt I’ll soon Iron out which Lady the words were about. People are talking about a recent edition of Newsnight this week. Poor Mr Brand. Clearly he can’t appreciate how lucky we are; he must be out of touch with the average person, unlike our elected and unelected rulers. We’ve never had it so good, or so we’re being told. The Newsnight interview can be found here http://www.treehugger.com/culture/russell-brand-interview-revolution-planet-is-being-destroyed-video.html . For Brand’s benefit, and to remind us all of our recent economic successes, Old Susannah offers a few timely definitions. 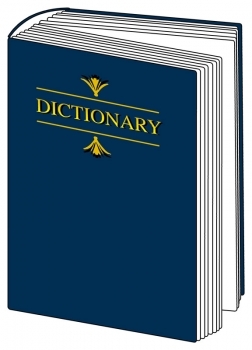 So, as you snuggle up in your perfectly heated home, eating your lobster dinner, and lighting your Cuban cigars with 20 Euro notes, directing the maid to clean the second bathroom again, here are this week’s definitions. Privatisation: (noun) to dispose of a state or publicly-owned institution by sale of shares. Remember what a huge success the sell-off of British Gas was? Lots of people got to make money on shares when the government sold off British Gas, and that was great. For some reason, we seem to be paying higher prices for gas, but I’m sure there is no connection between this and the privatisation. The recent sale of the Royal Mail is making us all wealthy beyond our wildest dreams. Result! So what if the future for postal employees is a bit shaky; they’ve all been given a few shares in the sell-off. I’m sure that in 3 years, when they are allowed to sell their shares, it will more than make up for any job losses or pension devaluations. I’m sure we won’t see any cost increases, layoffs, or change in the quality of service. The selloff must have been a success, because it was oversubscribed. The experts in the banking world who arranged the flotation may have made a teeny error in pricing the shares up, but since this hasn’t cost the taxpayer more than about £750 million in lost potential share sale revenues, it’s no big deal. 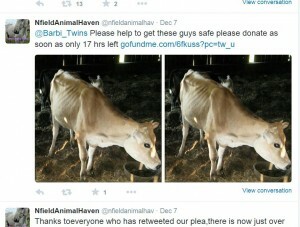 Shockingly, shares were not sold to anyone who wanted more than £10,000 worth. This sounds like discrimination against the rich to me. Thankfully, the many banks which were part of the consultation process got lots of money (about £17 million according to the Guardian) for arranging the sale. This of course helps stimulate the economy, as well as rewarding the long-suffering banking sector. Also, the many banks which had put in for shares largely seem to have been successful, to the tune of about £29 million. This is quite a happy outcome for the banking sector, even if it seems like quite a coincidence they managed to get so many shares and so many individual investors were frozen out. We’ve sold British Gas, we’ve sold our Royal Mail; we’ve sold off most of our water. These have been huge success stories financially. Operationally, there are one or two minor issues that crop up after privatisations, but I wouldn’t worry about that kind of thing. Thames Water for instance, had a few minor teething problems after its sell-off. There are pipelines leaking millions of gallons of water which go unrepaired. The new management choose to pay dividends to shareholders rather than worry about fusty, boring water infrastructure. They may have to pay the odd fine for polluting the UK’s streams and lakes, but this is just an operating expense. Thames Water has only had a few fines for pumping raw sewage into the environment, with one fine coming in at £204,000. Thames water also cut its workforce; but on the bright side, the chairman’s salary went up by several hundred thousand pounds per year, no doubt he was doing extra work, what with fewer workers on the payroll. But don’t worry – none of this is gives any reason to think the Royal Mail sell-off will have any negative consequences. A few job losses, a few thousand people out of work and/or with less valuable pensions, a few banks making tens of millions – that’s what keeps this nation great and competitive. There is no reason to fear the new owners of UK Plc. won’t decide to cut the water or gas. Just keep the candles handy, stock up on fire wood, and get a rain barrel – we’ll be fine. Union: (noun) A collective of workers organised and empowered to protect workers’ rights, health and benefits from employers who would seek to maximise profit margins at the expense of the workforce. There is one fly in the ointment for those benefactors who kindly seek to own key British industries and companies – the Unions. I’m delighted that private companies, often coming down to foreign governments, one family or even just one man, own crucial parts of the country’s essential utilities, resources and infrastructure. To the uneducated, this may just seem like either Imperialism or in the latter case like Feudalism, but remember how much better off we are. One such successful entrepreneur is the owner of Scotland’s Grangemouth, Jim Ratcliffe. It may not seem like it, but Mr Ratcliffe’s had to make many financial sacrifices to keep Grangemouth and its employees going these past few years. He’s not making as much money as he used to – there are rumours he’s down to only one super yacht, the 257 foot Hampshire II. Ratcliffe was shopping one day, had a spare £9 million to play about with, and bought Grangemouth from BP. With no choice, Jim announced he’d simply shut the facility, which is fair enough. Putting 800 workers, their families, the area businesses that depend on the custom of those workers in a bit of jeopardy probably just taught them a good lesson. Ratcliffe showed the unions he was boss. And by the way, we don’t really know how badly off Ratcliffe is, because the owner of arguably Scotland’s most important refinery keeps his businesses largely in Switzerland. If I hear of anyone starting a collection for him, I’ll let you know how to contribute. Before Old Susannah was old, I naively thought we needed governments to tax us so they could protect our rights, help us when we were too ill to work, and provide services such as schools, hospitals, clean water and energy. Such vital services I thought should be run without a thought to making money from them, and were so vital they should be protected from any form of outside or private control, for the benefit of the taxpayer. How I laugh now to think on this foolish ideology. Pay your tax, work hard, and good luck. Where you can afford to live and what you earn will directly impact how your children are schooled, what drugs you’ll be allowed to have if you are seriously ill, and how your granny will be treated in a nursing home. Work for a public sector employer such as Royal Mail or oil refineries at your own risk. Make sure you buy shares in whatever’s being sold next, and try not to think about the pollution caused by cost-cutting measures designed to improve profits, your spiralling energy costs, and the stealthy privatisation of the NHS. Forget the train crash victims who died at Hatfield; cutting corners on safety for profit was seen by the privatised management as a ‘cost of doing business’. Forget your library closures, school closures and hospital ER closures. If something starts to nag at you, then Old Susannah suggests getting drunk, getting wasted, or getting some engaging virtual world computer games to while away the hours. Don’t wonder why you are paying more taxes when you no longer have to support these vital services once privatised, and don’t ask why the uber rich are paying no taxes. I’m sure everything will be just fine. There we leave it for this week; but if you can suggest any other services that could be sold off, do get in touch. For some reason, I’m thinking of that bit of graffiti I saw again. The dust has settled on the City of Culture Bid, Round One; Aberdeen did not make the shortlist. Dundee however is through to Round Two. 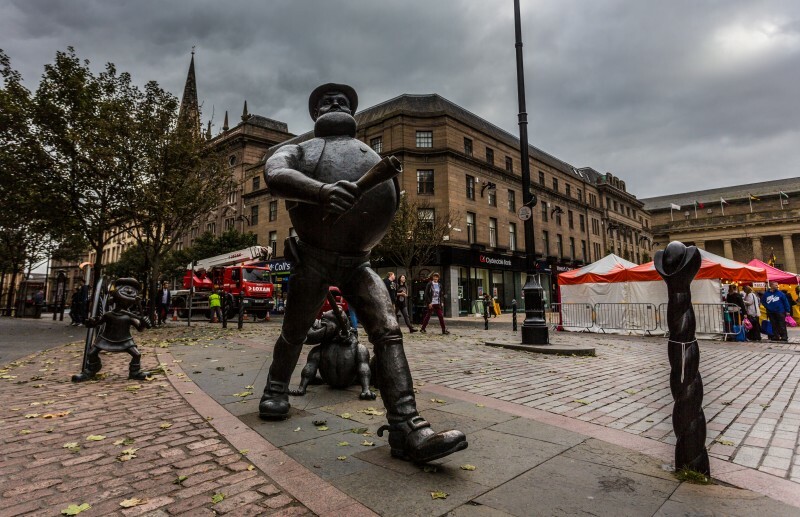 Following a review of bid material, recent events and a visit to Dundee, Suzanne Kelly compares the two cities and offers a few observations. It was meant to be so simple to win the City of Culture bid and it was meant to be another feather in the cap of Valerie Watt, Aberdeen City Council’s Chief Executive. She’d been at the helm when Derry won the right to be City of Culture 2013. For the Aberdeen bid, the usual city council suspects were called in and a number of arts and culture names and experts were signed up to create our submission. Rita Stephen, sometime secondee to ACSEF, past promoter of the City Garden Project, etc, was seen as the safe pair of hands for this task. Perhaps this appointment is why the bid often hones in on business retention and economic issues, with ACSEF getting a mention or two. Aberdeen needed to produce a sharp, smart and creative bid. The bid team had to demonstrate how the city nurtured talent, used existing assets and involved people. It had to demonstrate that it could come up with interesting new ideas. Seeing as we’re not particularly good at any of these things compared to other cities, the bid was never going to survive round one. So, how can a city down the road from us, without lots of oil money greasing its wheels, without its own ACSEF, and without a dominant uber-wealthy ruling class outperform Aberdeen? How did we wind up with the bid submission we produced? How does our city stack up in the culture stakes against our poor relations in the south? 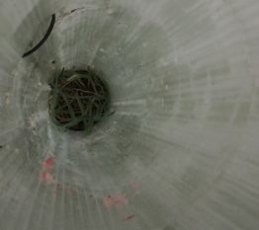 Would the lusted-after Granite Web in our city centre green space have wowed the judges? And what was wrong about Aberdeen’s proposed Gigs on Rigs? 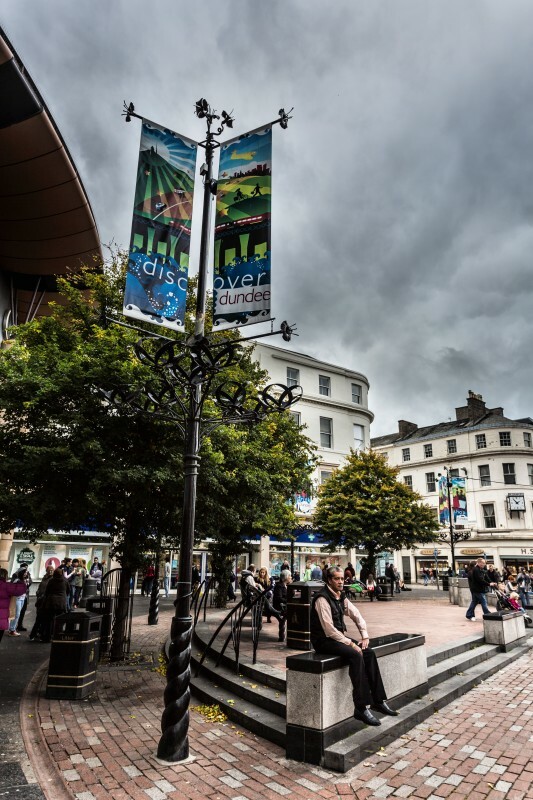 Dundee’s bid actively seeks input from its citizens and groups. It is well-written with sound ideas based around the arts, people, and the environment. It is clear that rather than drawing up pie-in-the-sky concepts, it drew on its resources and existing practice. The Dundee update webpage confirms the bid proposals, some of which require a bit more effort, but the proposals are not complete fabrication. They have the arts and culture base because they nourish their arts. To consult with people, Aberdeen took over the premises of what had been an independent music retailer, One Up. One Up had been forced to close, and in its day it contributed to our culture in showcasing local and larger acts and carrying local records. Having its husk used for the City’s vehicle of what culture should be felt a bit odd. Individuals were invited to write ideas on Post-It notes in the bid centre/One Up. I did, and there were many good ideas. There were also notes in pure council speak; such buzzwords as vibrant, dynamic, connectivity and transformational were much in evidence. If these words did have any power or real meaning, their overuse in every City Council report for decades in Aberdeen has reduced them to meaningless jargon. Predictably, the culture that was put on offer excluded anything remotely controversial, avant guard, or alternative. This was going to be a corporate, conservative cultural exercise. As to Aberdeen’s final bid submission, ‘transparency’ was lacking, even to some of those who were supposed to be writing it. A man who asked staff for a copy of the submission at the bid centre was asked, “And who are you exactly?” He couldn’t get a copy at the City of Culture bid centre. Perhaps this was not the ideal way to win support. Communicating with Rita Stephen and the FOI office afterwards for a copy should have resulted in the bid being emailed swiftly. In the event, it took several requests to get a copy. The first version received was redacted (ie some text was blacked out for secrecy). We’re used to this in Aberdeen. Most worryingly, it seems only a very few people had a say in how the bid submission would be carried out or what was going into it, and it is not clear if those in charge consulted widely enough with experienced arts and culture experts before the bid was submitted. What local artists, musicians, venue owners were asked for opinions? Who wrote the submission and who read it afterwards? Various one-off, specially commissioned events took place during the lauch run-up. 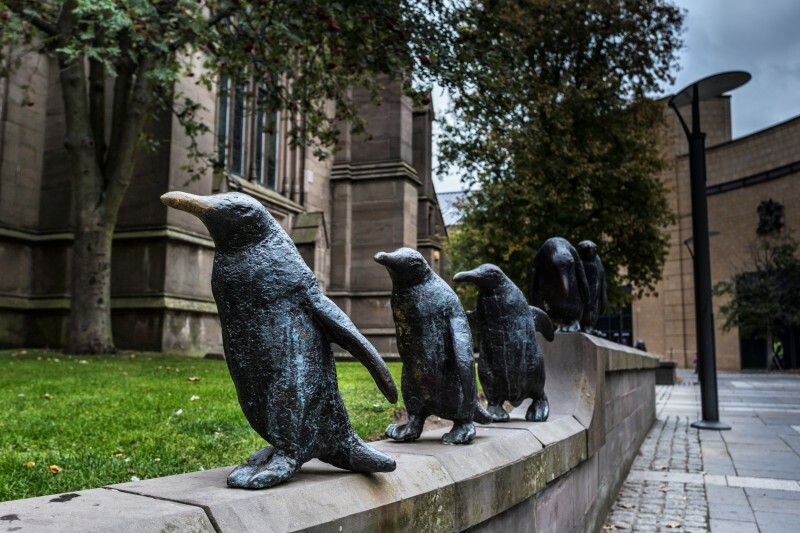 Despite the Lord Provost’s speech at an open photography exhibition in the gallery in which he stated that this would be a year of culture with or without bid success, the signs are this promise is fizzling out quickly. This photography show at One Up / the Bid office exhibited some good work, but there were far too many photos displayed too closely together. Hundreds of 3” x 5” images, only inches apart, competed for attention. A roughly-constructed installation piece with sound inside didn’t exactly fire the imagination. 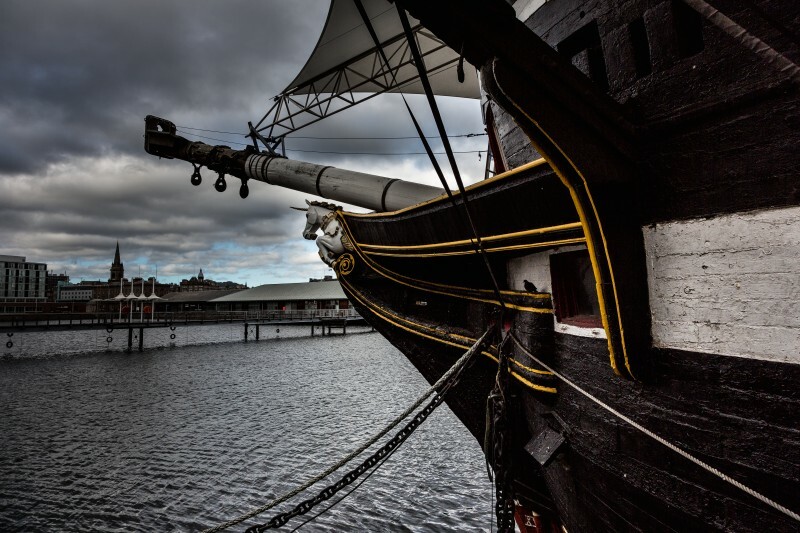 Dundee loves its waterfront featuring HMS Discovery. It loves the lesser-known Unicorn, a beautiful, preserved frigate open for tourism and events. The city holds events on and around the waterfront. Its town centre nightlife seems to lack as much severe public drunkenness as dominates nights here, although it does exist, as it does in any other city. It respects its green park. The river is for walking along, stopping at Discovery or Unicorn, or popping into a hotel bar. A new leisure complex has been erected on a site which is being revamped. The V&A will soon be on the riverside, creating real arts jobs where the old leisure centre stood. This is regeneration. Aberdeen chooses to ignore the leisure potential of Nigg Bay, for instance, and financially-motivated expansionists want to allow the industrial harbour to take over this important unspoilt recreational site. 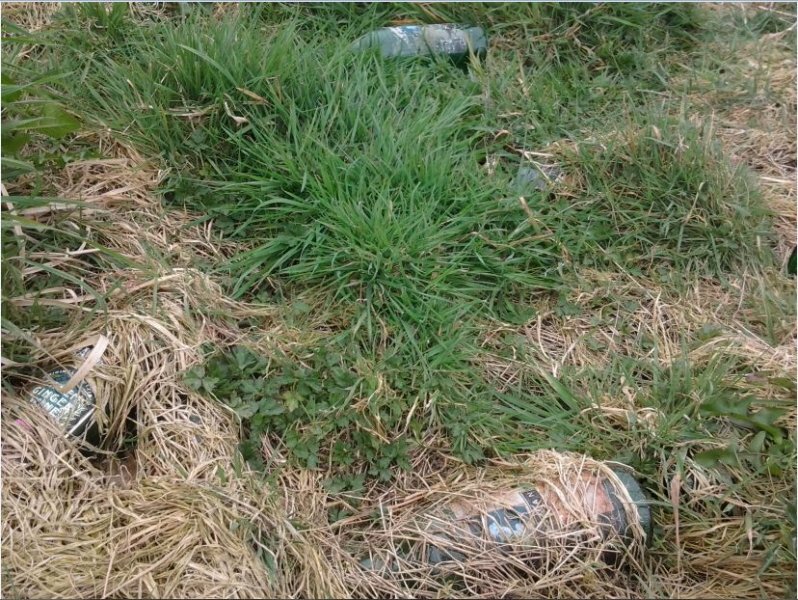 What that would mean to the life – wild, aquatic and human – in Torry in health terms can’t be good. Nigg Bay has two SSSIs, not that this otherwise important environmental protection matters in Aberdeen or Aberdeenshire, as witnessed by Trump’s Menie development. East Grampian Coastal Partnership sensibly and reasonably proposed to construct a small leisure and learning marina, but this idea seems to have been cut adrift. North of the industrial harbour, which by some coincidence has two of Scotland’s most polluted roads – Market Street, and Wellington Road – adjacent, is the Fun Beach. 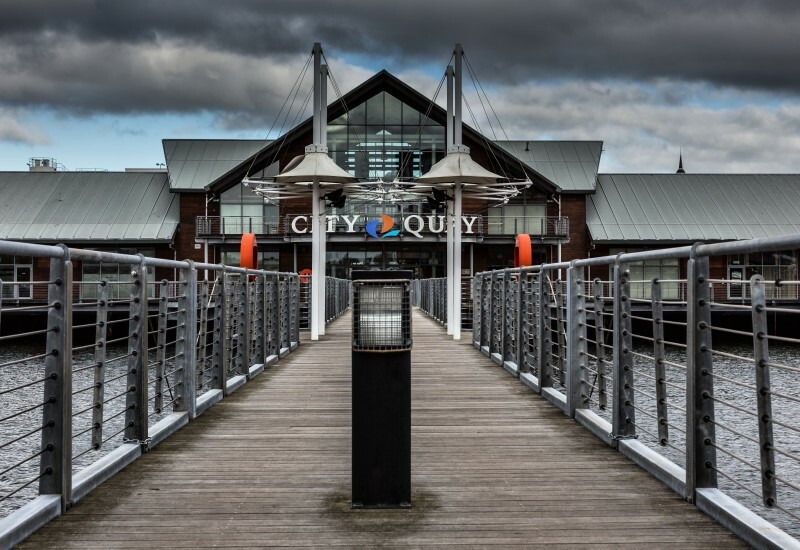 Admittedly some good events do take place nearby, but where there was opportunity for interesting seaside bars, restaurants and hotels, identikit shopping malls exist instead. Many on the seafront have no views out to sea, a waste of waterfront opportunity. Dundee loves the arts. 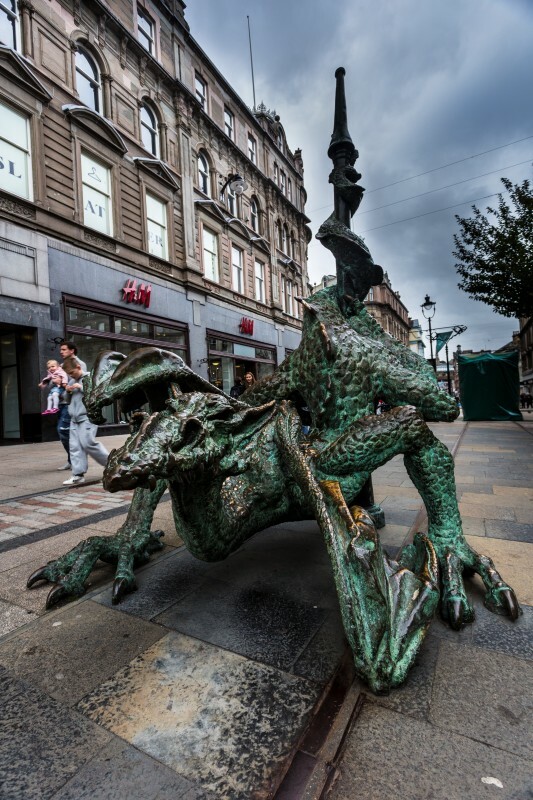 Public sculptures abound, and whilst tourists don’t visit specifically for the bronze Desperate Dan, Minnie the Minx or the wonderful dragon, these public artworks are appreciated, photographed and posed with. The city centre was busy the weekend I visited. Many were tourists who’d come for the day. I was handed a flyer for a fashion/vintage show. A dignified, attractive, creative market was taking place. Posters advertised bands and art events. The V&A@Dundee will generate over 300,000 visits per year and 200 jobs. In 2012 there were 2,414,362 attendances recorded at cultural venues in the city. 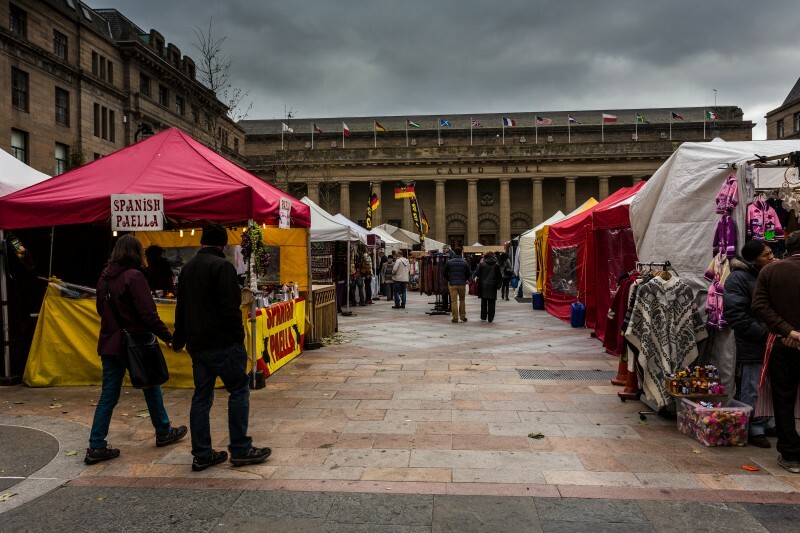 In 2012 217,009 people attended festivals and events in Dundee. Dundee is home to several independent creative collectives –Tin Roof Collective, Generator Project, WASPS, Vanilla Ink and Fleet Collective – with the aim of providing supportive space and resources for designers and artists. Discovery, Scotland’s International Film Festival for young audiences was the joint recipient of an international award for youth cinema in 2012. Dundee Rep is a leading Scottish cultural institution. It comprises the only full-time repertory theatre company in the UK, Scotland’s contemporary dance company and a cutting-edge community learning team. Scottish Dance Theatre tours internationally as cultural ambassadors from Scotland. Leisure & Culture Dundee was Scotland’s first charitable incorporated organisation to bring together a portfolio of culture, heritage, library and sporting resources into one charitable organisation. Creative Dundee has hosted global event night, Pecha Kucha Night events quarterly, since bringing them to the city in November 2011. The speed-presenting format has a 200-strong audience attend each event and has had over 80 local, national and international presenters talk. In 2013 Dundee City Libraries won the UK Bookseller of the Year award for public libraries. The Mills Observatory is the only full-time municipal observatory in the UK. Broughty Ferry Castle is managed in partnership with Historic Scotland, is an icon at the mouth of the Tay with a dramatic and bloody history. Caird Hall is one of Scotland’s most popular city centre conference and cultural venues. 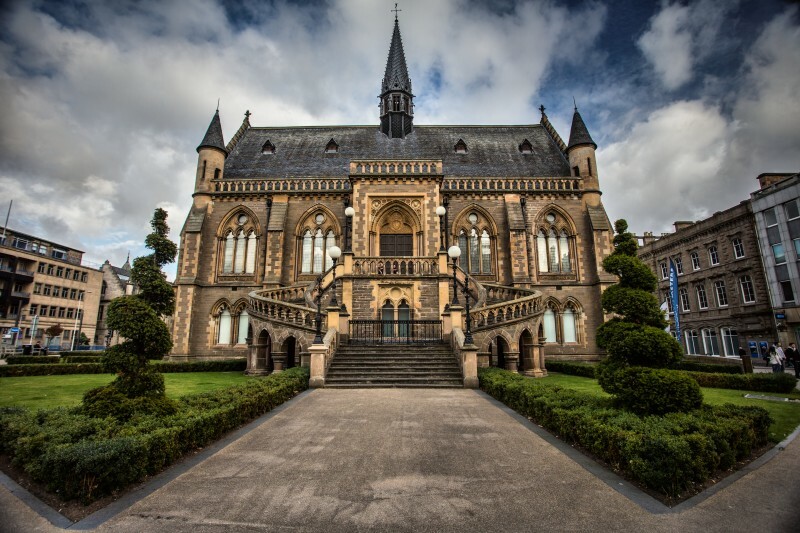 The award winning McManus: Dundee’s Art Gallery and Museum collections of fine decorative art and whaling artefacts have been designated collections of national importance. Duncan of Jordanstone College of Art & Design has an international reputation for being at the forefront of contemporary research in art and design. The Duncan of Jordanstone arts campus is a short walk both to the town centre, and the river, Gray’s School of Art is a ten minute minimum bus ride away from our city centre. Aberdeen has a great gallery with some outstanding work and exhibitions and we are fortunate that the annual National Gallery Portrait Awards tour stops here. The Arts Centre also plays host to a number of events and smaller groups and artists. However, the city’s treatment of local arts groups in the recent past is nothing to be proud of. News does travel through the arts community, and Aberdeen has some damage control to do. The Granite City has at least one bona fide billionaire who makes a big show of wanting things to improve, via building in a common good land garden rather than brownfield, whilst insisting the geographic centre must be the sole focal point. The world’s great cultural centres, including Rome, Paris and New York do not share this myopia (nor do Edinburgh, Glasgow and Dundee). Sadly, when it came to saving the small, independent Limousine Bull Arts collective, none of our well-meaning patrons could find their chequebooks. This modest collective brought art exhibitions, training and studio space to Torry, a supposed priority area for improvement. Past shows have included a dramatic historical exhibition on the effects on Aberdeen of the Second World War, a show of members’ work, and work created from some of their life drawing students. It brought people into Torry to talk about and enjoy art. The collective had to close its Torry premises due to lack of the sort of funds our city fathers might spend on a good weekend trip. What can be said about Peacock Visual Arts and how it got so far with its vision for an arts centre, only to be subsumed in a monstrously out-of-scale City Square or Garden Project? The proposal for the Peacock centre wasn’t loved by all, but compared to subsequent ideas, the Peacock plan was the least disruptive, most affordable and most environmentally-sensitive of all. Years earlier, the then Arts Council ring-fenced £1m or so for an arts project involving the Citadel. It was in no small part down to the then City Council’s lack of diligence that this never happened. The deadline came and went whilst the administration was inactive. Perhaps the worst, most visible recent slap in the face for arts, culture and charity was the closure of the worthwhile, creative venture, the Foyer. All manner of good work took place here, from helping people conquer their problems to encouraging fledgling artists to hold exhibitions of their work in the restaurant. Why couldn’t we save the Foyer? Why couldn’t public and private money be found? Why has nothing else come along to do the necessary work it did? The administration, Valerie Watts and Rita Stephen, who seems to have had a large hand in preparing the bid, seem unaware that these lost opportunities, thwarted arts groups and other initiatives could have been the very foundation for an independent arts scene. The council runs arts courses and arts events. Does it have some kind of issue with supporting non state-sponsored or patronised artist and art groups? You could be forgiven for thinking so. For real progress, and for creativity and community culture and art to grow, the city administration might want to consider loosening its controlling, conservative hold, whilst providing reasonable, accountable financial support. In less-controlling, insular areas, you’ll find arts and cultural activity taking place without having to have a government logo stamped on every ticket and every programme. Dundee is encouraging people to use its many facilities, to create, to spend time in its existing contemporary arts centre. 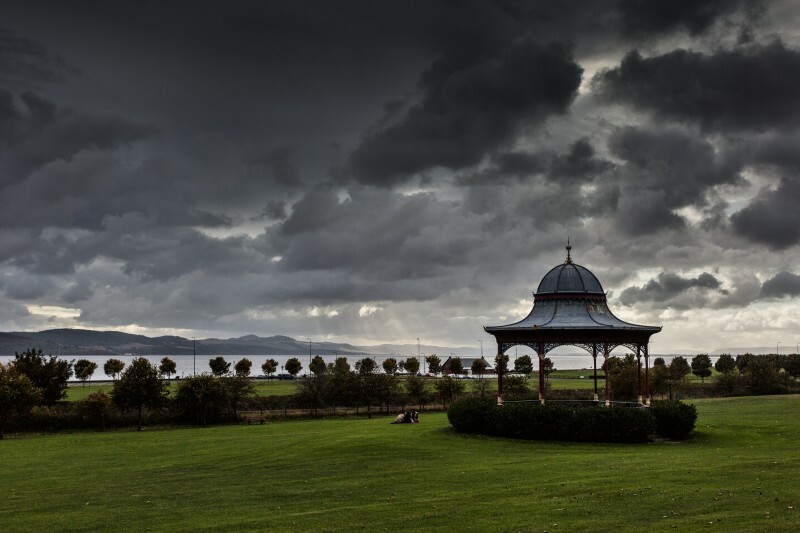 It has a large open green space with a pavilion at the end of the Tay. No-one is seeking to destroy it and no one is complaining it is under-used. It is a park. It is a green, healthy space. It is there for when it’s needed for relaxation or for events. Dundee’s jute, jam and journalism tradition has evolved, and past, present and future are all valued here. The events proposed, the venues existing and the forthcoming V&A will enhance what is already there and encourage more visitors. With its great reserves of personal wealth, helped here and there by offshore tax haven use and abuse, Aberdeen seems to have a considerable gap between the have-nots and the have-yachts. Arts and music education for school children were cut by the previous administration. We have a mentality here, personified in some of our most successful – financially speaking – residents, that the purpose of education is to learn how to do a job servicing the oil industry. Humanities and arts are not as much a priority here as in Edinburgh, Glasgow, and of course Dundee. This attitude towards culture and the arts is reflected throughout most of Aberdeen. The bill of goods we’re being hard-sold is that to fix our retail and city centre social problems, we have to build something in the only green common good land we have. No-one seems willing to rejuvenate our considerable brownfield sites, where potential exists for positive social and cultural improvement, or encourage use of the closed Union Street shops. Money rules here, but that is not always translated to the makers, artists, creators and arts educators in the private sector. Those teachers, small bars, clubs, galleries, art collectives which do exist, deserve our sincere thanks and our funding. Where Dundee has a host of well-thought through proposals, we had a no doubt well-meaning art student draw attention to our bid by painting himself a different colour every day and sitting in the window of a former indy record shop. Rita, or someone on her team, invented the proposed Gigs on Rigs. With the hallmarks of an idea scrawled on the back of an envelope after a taxpayer-funded expensive four course dinner, this was never, ever going to work. The idea was to fly bands to North Sea oil rigs, and beam the live shows back to Aberdeen, where we would pay to attend venues to watch bands play from the rigs. No-one seems to have looked into security, safety, or how bands would feel about this. I haven’t met a musician yet who’d prefer to jump in a helicopter to travel to an alcohol-free, freezing outdoor rig rather than play in a lively town and go out afterwards. No-one seems to have thought through why people would want to pay to watch remote gigs, how much it would cost, who would prefer a survival suit and a helicopter ride to a limo filled with champagne, and so on. The unpredictable weather that often delays flights to rigs is well known in the industry – what would have happened if an act couldn’t get to a rig to perform? But ‘gigs on rigs’ sounded good at the time, no doubt. I am rooting for Dundee; it would be fitting if its bid does well. Their ideas are sound, their encouragement and support for independent creatives is genuine and long-running. Their regeneration of brownfield is admirable. If we are to have the ‘smart, successful Scotland’ that Scottish Enterprise and other quangos claim to want in their jargon-filled reports, perhaps it’s time to stop this inter-city tribal competitive capitalism, and instead to realise that all our cities need to be encouraged and helped, not made to compete between themselves. Let’s all wish Dundee good luck, and let’s hope the local myopic, formulaic, conservative art mentality and Philistine environmental attitudes of our mandarins and city fathers may improve from watching what our close neighbour does. Suzanne Kelly gets to grips with the week that was with relevant definitions. Bells rang out across the land; families cheered; flags were waved in celebration; couples kissed in the streets. The happy news swept the world; the twittersphere nearly exploded. I’m sure we will all remember where we were the happy day Ian Tallboys collected another award for the forest created on Tullos Hill. Hip hip hooray. 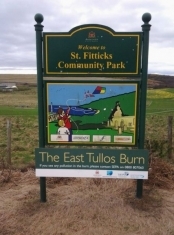 Yes, it’s good news again – Tullos Hill has won another award http://www.scotsman.com/tullos-hill-wood-commended. 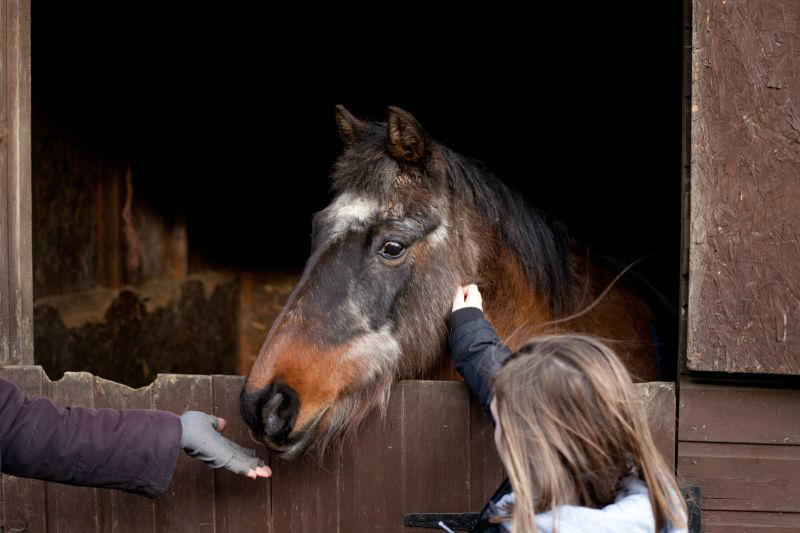 Chris Piper and Ranger Bigboy, who proudly collected the award, are captured in a moving article and beautiful photo, even more beautiful than Tullos Hill is at present. Weeds choke many of the new trees, saplings are planted amid household and industrial rubble in stony soil, the deer are gone – but it’s award worthy in this state all the same. Pete Leonard should be told that various ‘garden escapee’ flowers still manage to grow on the hill; he made it clear he had no time for the field of Dame’s Violets which used to cover the hill. No doubt he’ll want the remaining stragglers eradicated. 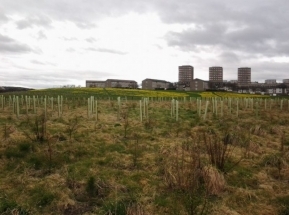 There is no news yet on the original proposal to make Tullos Hill’s future forest pay its way by producing timber. I hope they’re not holding their breath (or do I?). For some reason the phrase ‘don’t count your chickens before they hatch’ springs to mind. There are however actually signs of growth on the trees at St Fitticks. Soon some of them will be as tall as the surrounding weeds; tall enough to be hit by the salt spray from the North Sea and be hit by the 90+ mph winds we sometimes get. 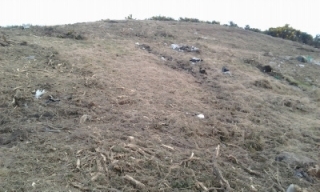 Thankfully the deer are all gone/shot/culled, so it’s only the soil, salt spray, strong winds and a few random vandals that stand in the way of us having a forest (on a spot where Mother Nature had somehow not planted one before we did – I wonder why?). What could possibly go wrong? 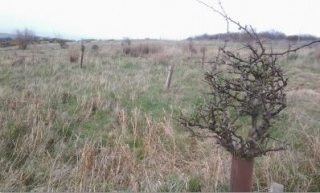 (note – in fairness there are a few positives as well as a number of negatives regarding the current Tullos Hill ‘state–obviously not for deer though. More on the state of the hill will be forthcoming. Thanks to everyone who came on our picnic last Sunday and congratulations to our experts on yet another award. While we’ve had those Tallstoryboys winning awards, there has sadly been a spate of bad boys lately too. Naughty councillors, apoplectic security guards and profane beer brewers all made this week’s local news. Advertising Standards Agency: (modern Eng. noun) An organisation set up to oversee advertisements for accuracy and profanity. It would be remiss of me to ignore that the ASA have deemed some of BrewDog’s website copy offensive. The use of the word f*ck (among other words) on the BD website was totally criminal, unacceptable, offensive, immoral and the rest of it. No doubt they had planned to turn the paragraphs in question from a small blurb amongst hundreds of other small blurbs on their page into tshirts, an MTV video, and a tv series. The whole world would have been offended. I’m very glad the ASA folks nipped this in the bud, or tried to. And to think I used to believe the ASA were feckless. The ASA knows what it’s doing and fearlessly pursues those who advertise falsely or offensively. Mind you, they were no help regarding the Union Terrace Gardens referendum. I’d been among complainers to the ASA and OFCOM about the content of the pro web adverts. Believe it or not, the promises for the web almost seemed too good to be true, but then I’m a touch cynical on occasion. The ASA wrote to me advising they had no power over all the ads and propaganda that appeared about the granite web. They said their hands were tied – they could not challenge claims the web would mean billions of pounds flowing into the city for hundreds of years, the green space would double magically, or that 6,000 desirable permanent well-paid jobs came with the web, and it wasn’t going to cost the taxpayer anything at all ever. I guess these claims sounded realistic or that the ASA didn’t want to get involved. Yet while the ASA shied away, OFCOM stepped up to the plate – after the referendum vote had taken place of course. Anyway, I’m glad the ASA team have sprung on this meaty topic. It must have been boring, trying to get energy company advertisements to give reliable, truthful information on energy pricing, or look at all the truthful, verifiable, legaly ads appearing on Facebook. Way to go. Doing a bit further research, I note there have been similar f-word issues. Thankfully, common sense has prevailed. BrewDog’s been smacked across its collective nose with a rolled up newspaper (possibly the Evening Express) for writing ‘f*ck’ on its website, while at the same time, French Connection U.K. remain, understandably, free to ‘FCUK’ around. I hope we can all appreciate the distinction between the two cases. Skateboarders: (mod Eng. plural noun) A youth subculture based around urban landscape two-wheel transport. I feel sorry for our local skateboarders; they would have been the true beneficiaries of any granite web. Mind you, at the rate we’re going, the entire shire will be under concrete soon, and ideal for skating. Most skaters do their thing without bothering people. Clearly two young boarders got under the skin of an oil business security guard. In a Facebook Video, the man loses his temper spectacularly. Was the guard taunted? Was it persistent annoyance from the boys? We don’t know. We do know our heroic guard used language the ASA would have had issues with, and chased the kids away – while chasing them down the public street, threatening GBH. Alas! the company in question has faulty phone lines, and could not discuss the incident when a concerned FB reader rang about the incident. Rumours suggesting the guard’s being poached by Malone to work security at Trumpland remain unconfirmed. Martin Ford: (Proper name) Aberdeenshire Councillor. Who’s been a naughty boy then? Cllr. Ford is in the doghouse, facing the charge of being a councillor giving an interview to the media on council property concerning council issues. The supreme commander, aka chief Executive Colin MacKenzie and nemesis Cllr. Gifford are out for Ford’s head on a platter for this. MacKenzie summoned Ford by letter to a meeting, somewhat like the principal sending a letter to your teacher summoning you to the principal’s office. How dare Ford give an interview at the council without getting a hall pass first? MacKenzie would have us believe that any and all interviews must be vetted and approved by him in advance if they happen to involve councillors talking when at the council. Old Susannah’s written to get answers to a few questions – It’s just as well that every one of Cllr. Ford’s peers has behaved impeccably at all times. I asked the complainers to answer a few simple questions for me:- where is the procedure set down for giving interviews; how many requests to conduct interviews were made; how many approved or disallowed; and what would the august Chief Executive who hands out the permission slips do if he himself wants to give a media interview? When they answer me, I’ll let you know. Until then, it’s the naughty step for Martin Ford. After all, we can’t have people going around using their positions in unauthorised fashion. It might be useful to juxtapose this anger over the use of council offices by a councillor with how the Scottish Enterprise logo and footage of Jennifer Craw got into the promo video made to convince us that Trump was the future. I remember seeing this video presented by George Sorial himself at a town hall style meeting years ago. I got in touch with SE asap to find out whether this was an endorsement and if permission had been given to use this footage. They coyly replied that permission had not been given to use the SE logo, which clearly implied that this government quango were in favour of Trump. Which of course they were; they’d spent taxpayer money on the promo DVD made to sell Balmedie to investors. Did Craw get hauled in to explain her presence in the film? Did SE make a protest and clear the air, saying they gave no permission? Definitely not. Clearly this kind of propaganda is allowed; Ford talking to reporters in the shire’s hallowed offices is, of course, just wrong. Things are just a little different in Aberdeen City Council. Old Susannah’s been to more than a few big meetings there now, and the funny thing is, after major votes, the councillors and waiting media just meet up and speak wherever and about whatever they want on council premises. It’s almost as if there is nothing wrong with councillors telling the public where they stand. Next week: more on the city of culture bid submission, which I’m still forcing myself to read. I had to stop at the ‘gigs on rigs’ bit; it was too exciting. Leaving aside the great-sounding, hip, happening concept title ‘gigs on rigs (which doesn’t at all sound like an idea scrawled on the back of an envelope after a long dinner), I am not really sure how this was going to work. First there is the fact the ‘city of culture’ was not really meant to be an ‘oil rig of culture’ hundreds of miles offshore. For some reason, oil rigs are protected by the highest levels of security and the inherent safety issues with access dependent on weather conditions. Would your average band want to fly out to the middle of the North Sea to spend an evening? Then there was the small matter of where these concerts were to be beamed in town, what acts would play (Toto? The Beautiful South? Deacon Blue? ), and how we’d cope with the massive influx of visitors and the ticket demand for people who’d come to Aberdeen to go to local venues to watch offshore gigs on rigs. This could have been our own Glastonbury. Suzanne Kelly gets to grips with graffiti, ghastly beer and grumpy dads. Another amazing week whizzed past in Aberdeen, under a super moon, bright and dynamic in its aspect. BrewDog’s AGM was indeed the beer event of the season. Great food, brilliant brews, lots of merchandise at great prices, and a presentation of good news were all served up with good humour. More on the day in another article soon. The BrewDog AGM could not have been any more different from the dismal CAMRA beer festival I attended a few weeks ago at Pittodrie. In fact, the only more disappointing thing would have been to watch a match at Pittodrie. I am still waiting for an email, a refund and now an apology from CAMRA. Its local operative virtually accused me of lying when I wrote to complain about different aspects of the dismal last day I attended. Despite my offering proof as to when I arrived, how little beer was still available then and so on, CAMRA’s local people insist I was wrong, and they verge on implying I lied to them (as you would do for a £15 refund). I complained to the national CAMRA PR people. I’d told them my friend and I arrived c. 3.30 (she’s got a time on the first photo she took minutes after we arrived; we walked to Pittodrie from BrewDog, where we met and had a half, which was just after 2.30). One beer was awful, we complained to the guy serving it who had been tilting the cask forward to get it to pour, and he agreed it was off, and gave us something else to drink. Well, that’s me told then isn’t it. Perhaps I should fess up and send them an apology for blatantly lying and for not knowing the name of the beer I complained about. They’ve asked me to wait for some exec or other named Paul Scrivens to get back to me (no word yet). 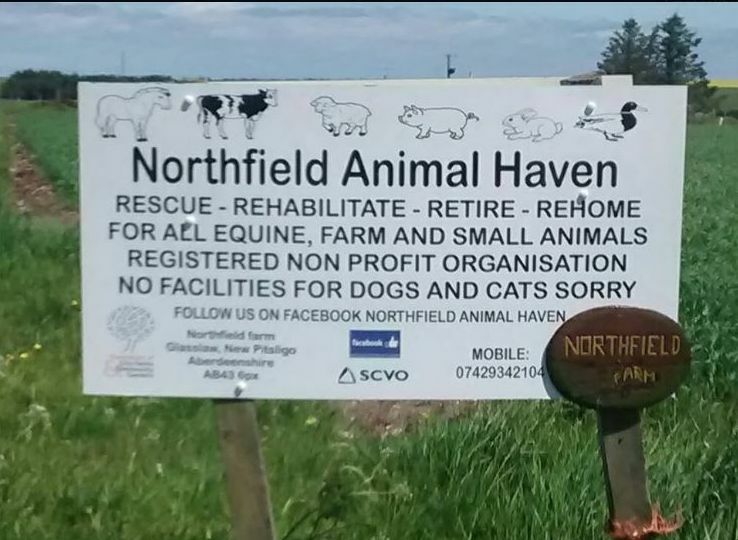 This is brilliantly good public relations. In any event, I plan to send a keg of the beer in question to ACSEF as a token reflecting my affection. Perhaps CAMRA think I’ll forget the dismal day and the accusations made against me. After all, it was some £15 pounds I wanted to claim back – they have every right to stand their ground. After all, what can I possibly do about it? While on the topic of PR, there is some bad news I am afraid. Well, bad news for Zoe Corsi of the BiG Partnership. In an astonishing move, the that decision has been made – the public relations work for NESTRANS and for ACSEF is going to be done by the Shire’s in house PR/Communications team. I know – you’re thinking ACSEF is so wonderful and so universally trusted and loved it can’t need any PR help at all. Still are the in-house team up to the challenge? Can they fill Zoe’s Jimmy Choo’s? Does this mean a pay cut for Morris the Monkey, the fictitious creature they used to sensational effect when promoting the granite web? The not-so-very-BiG-now Partnership will undoubtedly miss the £54K or so income it received in the last fiscal year reported in Aberdeen Voice . I do so hope that my exposure of the money flying around for PR to BiG last year hasn’t had any part to play in this unhappy scenario. Before getting on with some definitions, I just want to set the record straight on something. There is part of the city which is a dank, dark unwelcoming place. Over the years it became out of control and dangerous. Criminals operated from it, and the dodgier elements in society were there as well, intimidating others was part and parcel of the goings-on. There was often a smell of alcohol and urine. It was no place for children, even though a few did go in, they were tainted by being exposed to the rough crowd that hung around, shying from work. Even though it is definitely improved in the last year, there is still some way to go. Lastly, it is definitely not on the level. But yes, Aberdeen City Council is now on the up, thanks to getting a good sweeping out not long ago. Let’s continue to try and fix it, for even though it is better, there are still some dodgy elements there. There are many ways to fix problems with the city council, there are ways for people to protest, and ways for people to make a difference. With that thought in mind, it’s time for some definitions. Grafitti: (from Latin – writing). Artwork, words or painting applied to urban features, used to mark territory or make statements. Result! Rejoice! We have a visionary revolutionary (at least one) in our midst who is solving all our problems of government. It’s almost too good to be true, but some brave (yet strangely, modestly anonymous) person out there has sprayed their message on Marischal College and the Town House. And all this time the rest of us have been wasting time and energy lobbying, campaigning, running for office, making peaceful protests, making documentaries and even writing about problems to get things solved. Why didn’t we think of it sooner – the answer is just to deface our public buildings. Of course if the taxpayer has to pay a mere few thousand pounds to get one of the world’s most important granite buildings cleaned by experts to ensure there is no discoloration, then it’s just a price each and every one of us is more than happy to pay. I’m sure the artist in question knew he had a personal mandate from each and every person in Aberdeen to go ahead and spray our buildings. I’m feeling better already. What a positive contribution to intelligent debate. What a means of solving problems. What a great grasp our artist has of how things actually work. Clearly the councillors hold all of the power of change, and it’s nothing at all to do with the heads of department or the higher up mandarins, or those who write reports the councillors must accept or reject. There have been some positive changes; the new government has already done some of what it promised (like saving Union Terrace Gardens from the developers). But that’s clearly not enough speed and progress for our spray-painting hero. His message, which no doubt will start appearing on t-shirts was: ‘Ye have not yet done what ye ought’ – Well, whoever thou art who sprayest our building, I thinkest thou should gettest thyself a good lawyer, go public with your great deed, and get ready for the thanks of a grateful city. Oh, and considering your Town House graffiti was something about the ‘weilders’ of power’, gettest thou a dictionary as well. Vandalism: (noun; Eng – after Germanic tribe Vandals implicated in the fall of Rome) to deliberately deface, deform or destroy property or art. Vandalism is the art of defacing art for social change. Or at least that is what a member of ‘Fathers for Justice’ is trying to tell us. First a painting was damaged in Westminster Abbey; nice one. And this past week, in order to win sympathy for the cause, it was time to glue photos onto Constable’s famous painting The Hay Wain. Well done! First, the long-dead painter Constable certainly needs to have his artwork damaged to teach him and us all a lesson in what is fair for fathers. The connection between Constable, his painting of a wagon of hay, and injustice for this dad couldn’t be clearer. Now that someone’s attacked this painting, which obviously was doing a great deal of harm to wronged dads throughout the UK, the world will immediately cave in to the logical, well-made point, which of course is in no way tantamount to a temper tantrum or a blackmail attempt. Thank you Fathers4Justice; I’m sure your move will have won you many more supporters. Obviously our shared cultural history and irreplaceable art is as nothing compared to the pace of change you desire, and you not having your expectations met. No doubt in a few years’ time, little Mr Manning junior will brag to his friends of the brave, selfless act his dad committed against a painting. Fathers4Justice might do well to define exactly what constitutes direct action. For those of you who saw the film ‘Just Do It’ you saw people going to banks and power stations and protesting to those they held responsible for social problems. How very juvenile. What protestors should of course do is act like Dads4Destruction and start vandalising works of art rather than confronting tax evaders, dodgy banks and polluters. In addition to gaining more sympathisers, this new ploy by the dads just might be seen as an incitement to commit crime. * Sarcasm aside, I know many fathers who were treated very badly in the past, whether being ordered to pay vast sums of money to partners (not all of which were honest by a long shot) and/or refused access to children. Things have slowly started to change – change is usually a slow process – the CSA is still god-awful, but is perhaps not quite as draconian as in the past. Still, is the best way to prove to the courts that you are a fit and proper person to be in charge of a child defacing paintings, climbing on buildings dressed as batman? Possibly not. While I very much sympathised in the past, if their new vision is to incite new weekly direct action events which are based on destroying our art heritage, then they’ve lost me, and a few other people I suspect. Aberdeen Voice’s Old Susannah peers past the hot summer haze, smokescreens, and piles of unsold, undistributed P&Js and EEs to define the Deen’s dominant issues. By Suzanne Kelly. Tally Ho! 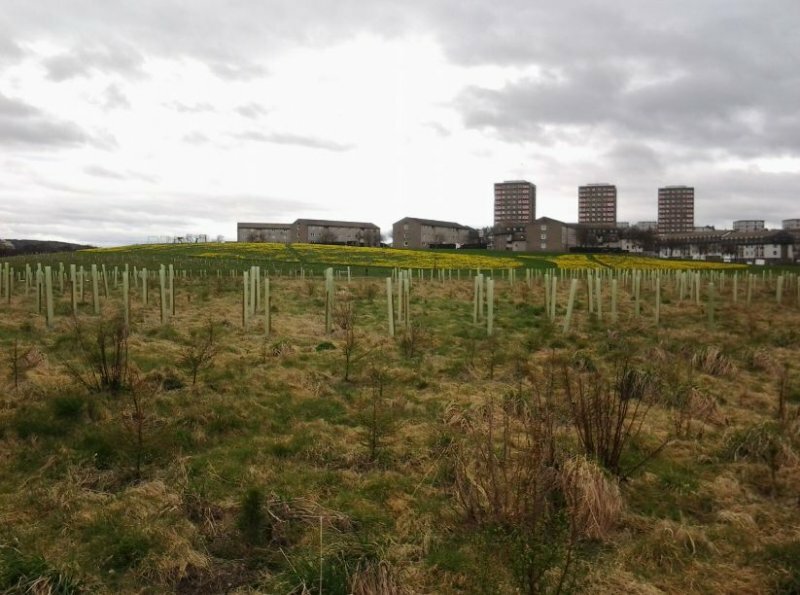 The big news this past week is John Swinney: he has come down firmly on the side of the City Gardens Project. Result! I guess I must have missed the part where we had a sound business case and where we threw out the economist’s assessment of the TIF application; I really must pay more attention. I’d also have thought that Swinney would need a little time to digest all the evidence – but most of the digestion he did was over ACSEF ‘working lunches’ (see below). Also on the theme of Union Terrace Gardens, we have a few upstart independent councillors about to launch a different option for the city centre’s future before the crucial 22nd August vote. Obviously there is only one solution, and that is the granite web to be put in place of the city’s green lungs. You couldn’t for instance build a civic square on the site of the fortress of doom, aka St Nicholas House – where’s the fun (or benefit to one Mr Milne) in that? No, the only answer to permanent economic prosperity, permanent career creation, jobs for the (construction) boys and eternal bliss, is the granite web. Shame on those indies. Now if they were part of some of the major parties, they’d just do as they were told and be done with it. Having said that, a news item tells me the SNP and the Lib Dems are fighting again; apparently over a boundary shake-up. The SNP wish to make the Lib Dems look bad. Personally, I think that horse has already bolted. Before moving on to some timely definitions, I’d like to thank the people in charge of roads at Aberdeen City Council for getting rid of all those pesky wildflowers growing on Wellington Road. Yes, those gigantic pansies, daisies and other wildflowers have all been mowed over. It’s good that there is no discrimination between 3 foot high grass and 3 inch high wildflowers – treat them all alike, I say. So if the bees get even less areas to feed on and if the remaining moths and butterflies are killed, no worries. Soon all will be covered in concrete anyway, so getting rid of the flowers before they went to seed is irrelevant. The same anti-nature mentality must be at work in whichever department allows fireworks displays – HMT has been at it again. In case there were any wild animals left in UTG not already scared off by Milne’s anti peregrine falcon goons, or by the previous fireworks, a brilliant (?) display of daytime fireworks was set off last week. Someone should tell the city that disturbing the bothersome yet protected by EU legislation animals (bats, birds, etc) is not supposed to happen. Can we please go back to having fireworks at the beach, and perhaps at night time? Word has it that fireworks can be seen to be more vibrant and dynamic at night. Summer months during which there is a shortage of serious news stories and the media often resort to printing non-news stories, ‘cute’ items and/or tall tales. Thankfully the ‘silly season’ is something our more serious newspapers are immune to. While the Evening Express may have endless photo competitions for adorable babies and so on, the mainstream press keeps its sombre, serious course. Stories such as the 7th August P&J piece on a white witch performing a ritual to raise the Loch Ness Monster are demonstrative of the mindset of the newspaper which wants us to take its word over the best future use for Union Terrace Gardens. This might seem like a textbook example of ‘silly season journalism’ to you, but I’m sure it’s actually a very important piece on comparative religion and marine biology. The mythical kelpie is apparently being used by some ‘creationist’ sects in the United States to prove that evolution is wrong and the bible is right about Adam and Eve. I guess the logic at play there is just a tad over my head. To combine a social meal occasion with business and/or politics; a form of lobbying. So – how did John Swinney get so interested in the future of our beloved Granite Web? It was over a working lunch. Or two. After all, it was over a few friendly dinners that Swinney’s higher up, Alex Salmond, met Donald Trump and was convinced that Trump’s needs outweighed Scotland’s only movable sand dune system (a SSI) and a few troublesome Scottish people. As above, so below. I’m sure that over a tasty meal, (although probably not at Nando’s, or Starbucks) Mr Milne and Mr Crosby must have left a clear impression that everyone in Aberdeen wants a granite web. No doubt over the brandy and cigars the alternative points of view (if any) were also made clear and the importance of the EU protected trees and animals, the web’s probably carbon footprint and that little matter of where to find a spare £90,000,000 were put in perspective. We should thank all concerned for throwing this little lunch I say. Who paid for any such working lunches? Why you and I did: ACSEF is publicly funded. Bon appétit! Something that obscures or deflects attention away from another thing in an attempt to mislead, or confuse. The previous administration made lots of noise about its ‘transparency’ – but most of us saw straight through that. Callum McCaig has accused the independent councillors of putting up a smokescreen. McCaig seems to imply that the Indies’ belief in a possible alternative to the Granite Web is just a smokescreen. Old Susannah has sought local examples of smokescreens to help define this tricky term. There is, for example, the noble attempt by Council employees who served up smoked deer. Anonymous ACC operatives gave an ACC letter to the P&J, which became a news story claiming that ‘two deer were found dead ahead of the (Tullos Hill) cull’. The implication was that the deer were suffering and dying (which all relevant animal charities hotly contested) and shooting the deer dead would help them (a concept I’m still working on). This story might have successfully deflected attention away from the other issues (there are many), but alas the attempted smokescreen failed. 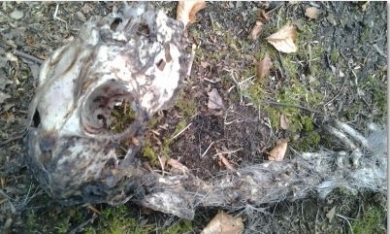 The deer did die in advance of the cull all right – two years in advance in fact (and of causes unknown). Deer live about 6-7 years and do actually die, believe it or not. Smokescreen FAIL. Searching for further whiffs of smoke, I must thank Mr Tom Smith (of ACSEF, the Aberdeen City Gardens Trust, etc. etc.) for providing me with a recent example. Just before the referendum (coincidentally), he was on the front page of the P&J with the sad story that he had been the victim of illegal computer hacking as well as harassment. Tom put the blame for this clearly illegal hacking activity on those who wanted UTG left without a web. This apparent victimisation of Tom created sympathetic feelings for him (didn’t we all feel his pain? ), just in time for the referendum. Is there any chance that this allegation of crime being committed against poor Tom, coming to light just before the referendum as it did, could have been a smokescreen? A smokescreen might have been useful to sway the vote, deflect attention away from other issues such as the actions of the ‘unofficial’ pro web group, which was free to publish what it wanted and spend as much as it pleased, operating outside of the referendum’s limits ? Surely not. There must have been hard, cold, direct evidence proving Smith had been hacked. Otherwise the Press & Journal would not have run such a story, just like they wouldn’t publish a news story about a kelpie and a white witch without concrete evidence. Yet when I asked Smith, ACSEF and the police for details of the crime committed, I was told it was ‘private’. Funny, how this public story quickly went private; just one of those things I guess. Sadly, Mr Smith, Chair of ACSEF, may be able to influence how public money is spent – but the public are not permitted to send him emails directly. The public must instead email Rita Stephen of ACC, who acts as intermediary. Ms Stephen explains that Mr Smith’s email address is ‘personal data’. I never did find out how a publicly-funded body like ACSEF would have its members’ emails protected by the Data Protection Act. I had written for info on the allegations of illegal hacking of Smith’s emails. I eventually received a reply concerning anonymous letters and something to do with pornographic pictures on social network sites (did any of you know there were naughty pictures on the internet?). Did I get a response to my direct question about email hacking crime? No. It was almost as if Mr Smith’s reply to me was a smokescreen covering up the smokescreen of the P&J article alleging a crime. Shockingly, it seems no illegal hacking has taken place. I don’t find anything in any subsequent P&J articles on the matter and I can’t find court publications to say anyone had been charged with email hacking. This crime could carry a custodial sentence and/or a fine (under Computer Misuse legislation). I think the smoke is clearing. Should Mr Smith get in touch now to say exactly who was charged with what hacking crime, I’ll get back to you. But it’s starting to look like some small exaggeration took place with conveniently strategic timing. One last thought; the smoke may clear completely in the near future. Audit Scotland has been asked to look at some of the financial intricacies of the interesting way in which work is commissioned, invoiced and then paid for regarding our sparkly granite web. Audit Scotland may not prove so easy to put off and they seem more than a little interested. Old Susannah No. 73 – Terrorism Is Over Special! Old Susannah comments on UK Government proposals to access emails between all citizens in the name of preventing Terrorism. There will be dancing in the streets, celebrations at public squares (as long as they are vibrant, dynamic and have connectivity), and rejoicing all ‘round: the government has found the way to stop terrorism! Result! Yes, the government is getting rid of terrorism. And your basic right to privacy. Why didn’t we think of it earlier, we are all wondering. Yes, the Government has decided it has the right to record each and every email you receive and send. And that is how terrorism will be stopped once and for all. I’m happy to give up my private life forever in order for government snoops to be able to catch the bad guys. I’m thrilled to be treated like a new prison inmate every time I want to get on a plane. I’m sure you are as well. So what if there are the occasional cases of disabled and/or elderly people being strip searched for having mobility aids. If the occasional frightened child is separated from its parents to be frisked, then so be it. It’s the price we pay for having the fantastic safe and secure lifestyles we have. It was said by an American founding father, Benjamin Franklin that ‘They who can give up essential liberty to obtain a little temporary safety, deserve neither liberty nor safety.’ How times have changed. You could also wonder how secure your business secrets will be when they are intercepted by unknown government spooks. Do people ever mis-use information? Hardly ever. The slightly paranoid J Edgar Hoover kept files on American citizens, and would occasionally blackmail people into doing his bidding. Liberty and Justice for all, except if the FBI wanted you. That would never happen here. Of course a senior police official was recently found guilty of accessing data on an ex-partner of his right here. I’m sure this was just a one-off, no need to trouble ourselves about it. It’s also a very good thing that terrorists would never use the Royal Mail. Except for those charming people who sent bombs to Celtic’s manager, that is. No one would ever think of using the post for smuggling, planning terrorist attacks or anything else we should concern ourselves with. Phew! It would be terrible if there were any civil disobedience over this great move. For instance nothing is stopping you from going to an internet cafe, and creating a free email account under the name of john smith. If enough people did this, and only sent or checked emails at internet cafes, then this little snooping plan of our kind government’s would be toast. Old Susannah thinks this great scheme might run into a few wee problems anyway. For one thing, I keep getting all sorts of ‘spam’. Multiply all the emails selling you drugs or which try to get your personal details out of you by the country’s population, and you’ll need a bank of computer storage just to keep the spam. Perhaps we should all go back to sending letters. Greetings everyone from our safe house in Torry, where we were airlifted to after our beautiful meadow home on Tullos Hill was destroyed – for a LibDem election pledge. We are surviving the cold snap OK, because we have lots of dead leaves to hide under to keep warm. (gardeners should always leave some dead leaves or other mulch around to keep plants – and creatures like us – warm). We are even more worried now about our old friends on Tullos Hill. The deer have nowhere near as much gorse to shelter in and it’s cold. The birds lost lots of their shelter too when the gorse was ripped out. We are fine – but we wish our friends were, too. The Labour Party have announced they would – end the Granite Web in its tracks if elected! Rather than borrowing £140,000,000 to put concrete ramps over our garden, chop down 250 year-old trees to turn into wood chip, they seem to want to spend time and energy on helping people. Gerry Brough, city employee who has generously volunteered to work on the project is said to be incandescent with rage. So no change there then.